Ah yes, the Turkey Burger. For those of us approaching our middle age, it can be a painful reminder that the “party is over”. Whether it’s watching your fats, your cholesterol, or whatever the hell your doctor says is now wrong with you, the Turkey Burger has become something akin to the meat equivalent of Methadone for aging hamburger fiends now having to moderate their intake of whatever they can’t eat anymore. And of course, most of the storebought turkey burgers out there sorely lack the flavor of their beefy counterparts, so its an insult to injury having to eat them in the first place. But it doesn’t have to be that way. Turkey Burgers CAN taste good, but we have to dispell the notion that they are taking the place of beef or should try to taste like beef burgers in the first place. No, to make a Turkey Burger taste good, it requires some outside the box thinking. You too can make a tasty Turkey Burger. Click on the “Read the rest of this entry” link below for more. First lets talk about seasoning, because God knows, ground turkey needs it bad — it has almost no flavor character whatsoever, being a very lean white meat. We also have to approach it from the perspective that turkey is poultry — it will never be red meat, it can’t ever possibly taste like red meat, and to approach it from a red meat seasoning perspective is just plain asinine and self-defeating. 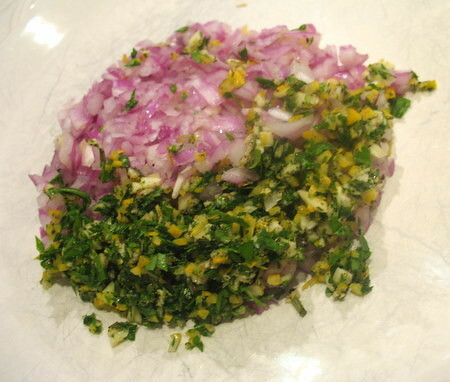 What we’ve got above is some chopped red onion (shallots would work really nice too) and some gremolata, which is a finely chopped mixture of lemon zest, parsley, and garlic. Alternatively, you could take the Latino approach and make some sofrito and use that as your seasoning base too. The key here is to really, really kick up the flavor level in the meat, because it’s really going to need it. I’ve also added some fresh rosemary from our herb garden, which is another good herb for use in poultry. A little bit of herbes de provence would be nice too. Hot Sauce. 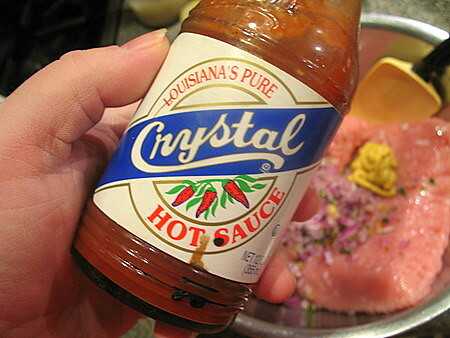 I like Crystal, but you can use any favorite hot sauce you’ve got. Give it a few nice shakes. Here we’ve mixed up all the meat, herbs and spices, and portioned out the burgers into 5oz-6oz portions. 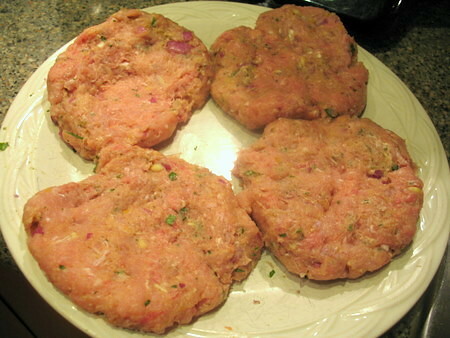 I’ve also set aside four more pre-formed burgers that I put in the freezer for the next time I want some turkey burgers. I also have a couple of portobella mushroom caps which have been cleaned, and coated with olive oil and seasoned with salt. We’re going to throw these guys along with the turkey burgers on the grill. 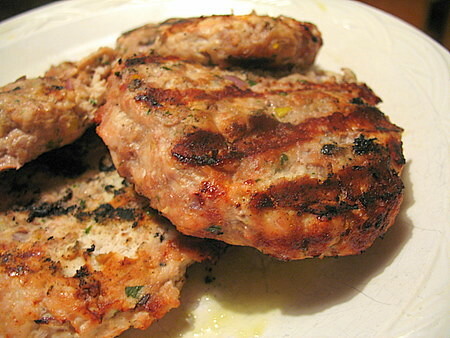 Turkey burgers, after being grilled six minutes on each side, cooked through. Unlike beef, you need to cook poultry until its completely done, because foodborne illnesses and bacterial nasties are not your friends. This is why we have so painstakingly seasoned these burgers, because we don’t have the luxury of eating medium-rare meat and letting the natural juices really speak for themselves. Burger assembly. Coat each side of your toasted burger bun (I’ve gotten some whole wheat buns here) with a small amount of mayonnaise. 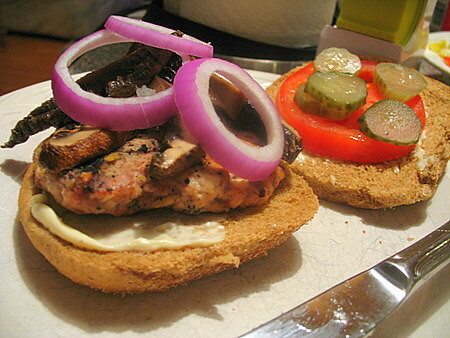 Then lay the burger, some portabella slices (to act as a contrasting meat texture and to add some juiciness) some fresh red onion slices, ripe tomato, and pickles. Enjoy. Serve with a nice salad on the side. 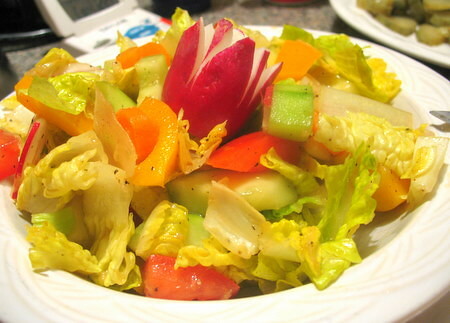 This entry was posted on Wednesday, April 11th, 2007 at 10:30 pm and is filed under Food, General, Healthy Eating, Recipe. You can follow any responses to this entry through the RSS 2.0 feed. You can leave a response, or trackback from your own site. Sofrito is a nice condiment…i like to add a drop of achiote oil, too, for color and flavor as well… then I like to add some matchstick fries, for my version of a turkey “frita”, the cuban hamburger! I use some “Slap Ya Mama” seasoning which gives them a good taste and is quick and easy to do. omg what is “slap ya mama” seasoning? this will be my first time making turkey burgers. trying to go healthier. i have used turkey for tacos and i know it needs a lot more seasoning! In a way parallel to turkey burgers I often make turkey meatballs. Lidia Bastianich has an excellent recipe in her “Family Table” book. The flavor enhancers include ground up dried porcini, pine nuts, onions, and golden raisins and the sauce in which they cook. Yeah. Turkey meatballs are the way to go. Also, there’s the trick of mixing ground meats. A nice turkey/pork mix works well. Spice-wise I’ve tried just about everything. A lot works with Turkey, as long as you keep in mind the fact that it needs a lot more spicing than beef. And actually a much wider variety of additives work with turkey than with beef. Sweet and savory solutions work equally well. Looks great. Just watch out for those restaurant turkey burgers. With a few exceptions they tend to have the same amount of sat. fat as their beefier brethren. We love the tukey burgers in Jane Brody’s first cookbook. Sometimes we add Old Bay Seasoning to spice them up. Delicious! Also great served with peach chutney. I make them with some breadcrumbs to hold it all together a little better and then a combination that usually includes salt, pepper, cumin and the should-be-famous Cruz Bay Grill Rub from St John Spice in the USVI. Grill them and serve with either Aoili or some sort of hot sauce concoction. We started eating them about 2 years ago because you can’t find ground beef in Raleigh that didn’t originate in a plastic tube. I was skeptical at first, but you’re right, it’s all about the seasoning. 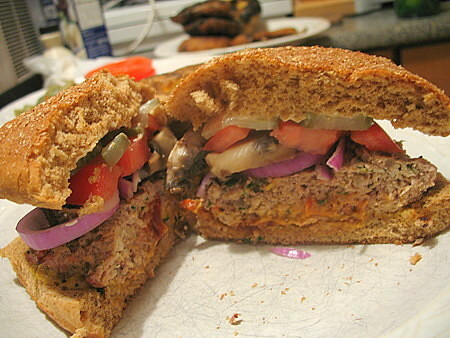 Beleive it or not, since I don’t eat red meat, I often crave a turkey burger. Nice. I just made excellent turkey burgers for dinner tonight: 1lb 7% meat, 1 T EVOO, 1 medium onion brunoised, pepper, tons of salt. I cooked them in a cast-iron pan with a thin sheen of oil, because it’s too gross to grill out. Don’t handle them too much, pack them loosely, and yank them off the heat as soon as they’re cooked through. I like to start them in a smoking-hot cast iron pan, but I cut the heat down to a medium-low level once they’re in the pan. That way they get a nice crust but they still cook through before overcoloring. They were soooooo good. I stir-fried some sugar snaps to go alongside. I eat ’em with lots of ketchup. Like a few of the commentors here, I find a bit of ground pork and breadcrumbs to be a good addition. 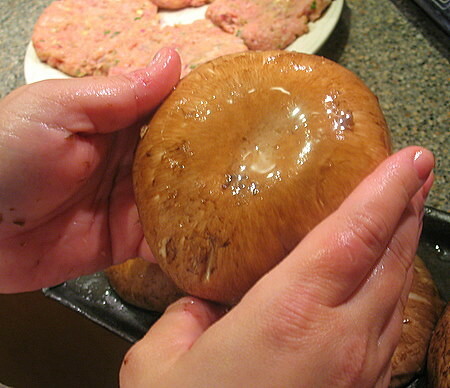 Good call on the shrooms – I’ll shred a few and add them to the patty. You know what I’ve also found that adds a real “meatiness”? MAGGI! It’s all about the umami. I am currently watching my cholesterol and my saturated fat intake. I can have 150mg of cholesterol and about 13g of saturated fat a day. That means I can have a 6oz of 90% lean cooked ground beef (8oz raw – 147mg of cholesterol and 9.3 g of sat fat). The equivalent amount of raw 7% fat ground turkey that I can eat is 6oz (140mg cholesterol, but only 4.71g of sat fat). If you aren’t willing to eat smaller portions of beef or turkey, you can always eat ostrich. A 8oz cooked ostrich burger only has 60 mg of cholesterol and 1g of Saturated fat, and it tastes like beef!!! You could probably eat a 1lb ostrich burger and not break your diet, as long as you had 520 calories to spare. To spruce up any sort of ground meat, I add plenty of dried spices. Whatever I can find in the spice rack, or from the garden that I dried in my dehydrator. The real key is to add tons of garlic powder and paprika. Adding fresh herbs tends to make meatballs/hamburgers fall apart, in my experience. After adding a handful of dried herbs and spices, I add a tablespoon of barbecue or hot sauce. Then you mix it with your hands and shape into meatballs or hamburgers. And don’t over cook them! I tried this recipe yesterday — SOOO GOOD!!! My husband hated turkey burgers but went ballistic over these! Just make sure you make the burger patties large enough because they shrink a lot. I used dried parsley with a “lemon-pepper” mix that I picked up in the spice section of the grocery store, because I couldn’t find anything called “gremolata”. Props to whoever came up with this recipe! One more thing… I boiled a moderate amount of water in the saucepan and melted a beef boullon (spelling?) cube to kick up the flavor that much more and then let the patties simmer in the water. Ok, I’m done. This is great! When I’m lazy, I season my turkey burgers with powdered Lipton Onion Dip mix. It definitely gets the job done, and it’s tasty with fried onions and cheddar. When I want to be healthy, I add ground flax seed to the mix; this actually helps as a binding agent. The ground flax seed is even good in turkey meatballs if you don’t have/don’t want to use breadcrumbs. I finely minced lemon zest,apple, garlic, and onion and had`godd results. I made one immediately and am letting the last marinate. I am sure it will be better but the first was better than a beef burger. I tried this recipe tonight (I added some bread crumbs) and it was delicious! Thank you! I tried this recipe last week with a little variation, but loved it! thanks for the tips! Jason I agree with your combo, dijon mustard, soy sauce, crushed garlic, pepper , a splash of balsamic, works great. Brush with olive oil , grill and serve with mushrooms, sweet caramelized onions, and some really great cheddar. Or, italian style mix turkey with crushed garlic, splash of balsamic , salt , pepper and grated parmesan cheese. And make a ‘pizza burger’ with melted part skim mozzarella and either some marinara or tomatoes and basil on a nice bun. Just made my turkey buger with Emeril’s Bam Burger seasoning and nothing else….wow…surprisingly good..Topped it off with a schmigin of blue chees crumble and I’m not feeling so bad anymore about the prospect of eating a healthier burger. Cheers! Thanks for the grill time tips!